About ten days ago I went to see Wreck-it Ralph. I had read a review that made it sound as cutesy as Hotel Transylvania, and that prejudiced me against it, because I saw Hotel, and there were parts of that cartoon that made me gag. Other parts made me smile, however, so I rated it a C as far as animated movies go. Everyone else who had seen it said Ralph was great, so I decided to give it a chance. It turns out to be a pretty good story. As a cartoon, it does well, all the things that Disney does well. I have a feeling for misunderstood bad guys. Every character is an archetype, but their motivations are clear and easily understood. There’s a message in the movie, and there’s lots of bubblegum music, bright colors, and flashing lights. What’s not to like? Poor misunderstood racer who just has to win the big race to redeem the world. And yet, if you forget the annoying kid aspect and cliched storyline, and just let yourself experience the fun aspects of the Sugar Rush world, it’s great. I do have the ability, still–Thank the gods!–of being able to turn off my inner curmudgeon/critic. When that sourpus goes away, even Vannelope Von Schweetz becomes great fun. I think Disney has a real winner with Wreck-it Ralph. There’s one really cool concept in the film–Game Central Station, a place where all the characters from various video games can get out of their own games and meet each other on neutral teritory. It also allows them to enter other games. I like the idea of characters being able to switch worlds and experience other realities. I like the idea that there are real personalities, people, and lives in the video games world–by extension in all fictional worlds. I was in a place like this once, but it was in London and the real world. It has been a long time since I’ve seen this concept of the wider cartoon/video world inter-acting with our own. 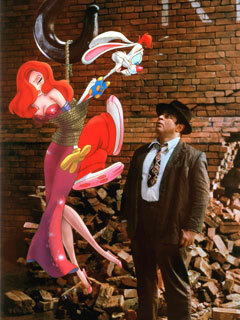 The last time was in Who Framed Roger Rabbit? And that was 20 years ago! Jeez! Time flies when you’re having fun. What most people forget is that Roger Rabbit featured cameo appearances by dozens of other popular cartoon characters. And it interfaced cartoon reality with human reality. Ralph does the same, but with video game reality taking the place of cartoon reality. Studios go a long way today to make movies into more than just a one-time trip to the cinema. Every movie is a merchandizing opportunity, and I’m sure there will be Wreck-it Ralph toys available–if only at the Disney stores. More immediate fun can be had at the website for the movie. Disney has a website full of games based on their movies and if you go there you can play the games featured in Wreck-it Ralph. That would be Fix-it Felix, Hero’s Duty, and Sugar Rush. Wanna be a space marine fighting alien bugs–you can do it. Wanna be a wacky racer? Most of us have the urge for speed, and driving games are always a blast. Even I liked it, and I have no reflexes and came in last every time I tried it. So, big thumbs up for Wreck-it Ralph, the movie that proves even bad guys can be heroes. I’m gonna say, get a kid, or be a kid, and see Wreck-it Ralph. It’s a better movie than Hotel Transylvania and a lot of fun. I give it a B+ and predict that Wreck-it Ralph and Fix-it Felix will be with us for years to come. If you saw Ralph, or would like to live in a stump in a dump full of bricks, why not leave a comment?